A high pressure system to the north is moving away and will be followed by a moderate southwesterly wind flow over the North Island on Saturday. The wind will swing more to the west over the North Island during the day and become lighter. For the South Island there will be strong southwesterly winds on Saturday moving more to the north west and moderating during the day. On Sunday most of the North Island is forecast to have strong northwesterly winds. Wellington and the South Island are expected to have strong northerly winds as a low pressure system approaches the South Island. As dawn broke a light offshore wind was blowing so I drove down to my favourite fishing ledge for a quick set with the kites before my mates arrived in Mokau. I caught two fat snapper, a 16 pounder and a 22 pounder plus some school snapper. Over the summer months we have a monthly contest called the Snapper Ladder at the Awakino Pub, just down the road from Mokau. There is a tray of beer for the heaviest snapper and one for the average weight. I rushed the 16 and 22 pound snapper down to the pub for weighing and collected the tray of beer for the heaviest snapper I won the previous month. I am competing against all the boat fishermen in the contest and it goes to show how successful and rewarding kite fishing can be. Unfortunately the 22lb snapper only came 6th on the May ladder. 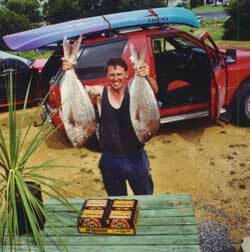 The winning fish weighed 11.8kg and was caught from a boat. The second placed fish was caught by another local kitefisher Tony Johnson. His snapper weighed in at 11.2kg. June was the final Snapper Ladder month and I was the only person to weigh in a snapper, so I received two trays of beer. 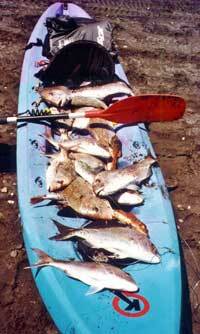 Kitefishing is not only a lot of fun, it is also very enjoyable. I thought you may be interested in what we do with our rigs when there is no wind for the kites. Because we usually have a 50/50 ratio of getting dumped or getting past the waves and out to sea a wet suit is recommended. To tow our kite rig out with the kayak we disconnect the kiteline and tie the mainline to the kayak. Also tied to the kayak is a plastic grocery bag a third full of sand. Before rowing out we connect all the traces to the hook section and lay the baited hook section carefully along the beach above the reach of the surf in a zig zag pattern. This allows the rower to go like hell through the waves without having to stop to attach the traces to the mainline. When you get out to where you want to fish you connect the sand bag to the line by threading the line through the handles. When we start pulling the line in, the bag rips open releasing the sand and makes it easier to pull in. It also allows the empty bag to be retrieved. After my successful mornings fishing I arrived home to find my mates Steve and Kevin were there. When they saw what I had just caught they definitely wanted to go fishing. Luckily Steve had brought his kayak with him so even though the wind had died we decided to tow the gear out with the kayak. So it was straight back to the beach for me! The photos above show us putting the first set out. The photo to the right is what came in on the first set, 14 snapper and one gurnard. All the snapper weighed between 2 - 3kg. All the photos in this report are from the same day and were taken during May this year. Thanks for the voucher and the return of my last lot of photos. I would appreciate the return of these photos. Jenny Caddick and her partner with their catch. The week started off quietly, Saturday saw three people on the beach with a few gurnard and kahawai caught. On Sunday a few more braved the strong winds. There were some good catches of whitebait on Friday and Saturday. Monday the sea was calm but no wind till later in the morning. Jenny Caddick and her partner arrived from Palmerston North to have a go at kite fishing for the first time. On their first set they caught three gurnard, one skate, one kahawai and one red cod. All these fish were taken on salted bait. They had one other set after I took the photo but I don't know the result. Tuesday the sea was still calm with a westerly wind gusting up to 30 knots. Doug Bassett arrived from Dannervirke with his three boys. On their first set they caught two gurnard and one kahawai. Doug cut the kahawai up for bait and set his Dropper Rig again with 15 hooks. They caught 14 gurnard from 15 hooks! Doug called into the shop on his way home for the photo. 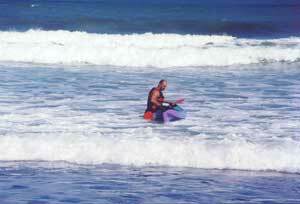 Don't forget about our Beach Marine kahawai fishing contest, this closes 28th October 2002. All kahawai caught on the beach are eligible and entry fee is free. 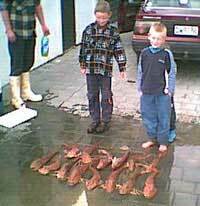 The Bassetts with their haul of gurnard. NIWA have tagged 22,000 snapper on the west coast of the North Island. The research project is to be used to help determine the biomass of the SNA8 stock, the fish were tagged between February and March 2002. Most of the 22,000 fish were caught and tagged in shallow water, less than 25 meters depth, because that was where the fish were most abundant. The project is designed to get an estimate of SNA8 biomass (size of the snapper fishery on the west coast) over the next year. All fish where caught by trawlers with short tows (between 2 and 20 minutes bottom time) and tagged with magnetic PIT tags implanted into the gut. Much of the commercial snapper catch from the west coast will be scanned for tags over the next eight months. If recreational fishers find one of these tags (like a small plastic pill with copper wires) when gutting their catch they can return it to NIWA. Recreational returns will not be used in the stock assessment side of the project but will provide useful information on growth and movement. If you measure the length of the fish from the nose to the fork in the tail, record this plus the date of capture and describe where the fish was caught. There are no rewards offered this time for returning tags but they will try and follow up any returns. Tags, fish information and your details can be posted to Jeremy McKenzie NIWA PO Box 109-695 Newmarket, Auckland; or phone (09) 3752050.
" We wanted the tagging programme to reflect where the fish were, so we went right in close in the big trawlers. Normally they can't go inside a nautical mile, and the skippers enjoyed the fact they could go closer. But 60% of the snapper were in less than 25 metres, which is about the mile limit, during February and March," said Jeremy McKenzie.
" We tagged some pretty big fish, up to 90cm, and on one tow south of Raglan we caught 150 fish, and half of them were over 70cm. We saw kite fishermen all the way up the coast, and they are fishing where the fish are; most of the snapper are within a nautical mile off the coast from Spirits Bay to Kapiti and as the commercial skippers said: "There's your conservation." I have been fishing Tokerau Beach all last week and have been slamming into fish of three kilos, averaging between six and twelve fish from a set of 25 hooks. The secret is to put your line out at about 5.30 pm and bring it in about 8-9pm. You will always get a feed. It's a waste of time fishing there during the day but the fish are coming in at night for a feed. If you want to catch kahawai dont use any weights and just let it out for 500 metres and bring it back. We fished our Bottom Longline Rig at Omaha last Sunday. We put out 25 hooks and returned no fish and no bait. It was probably paddle crabs! Please help me. I need to find another keen kite fisher who is prepared to go kite fishing with me. My mates are all shift workers and can rarely make it when I call and say lets go. I have a 4wd , a good kite rig, but need some more buddies. 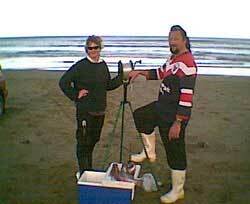 I am in Auckland and often fish Te Arai Point, Omaha and the west coast. First time I had tried to use the new Nighthawk Kite I got on Friday. It went out very well. I only let it out to 600m and got no fish of any type. Tried three sets at about the same distance each time to no avail. Went and had another go on Sunday and had to tack the kite. Again the kite went out very well. I put out two sets, the second out to 1000m but still no fish. I am led to believe not many fish were caught by anybody else either, but I think it could have been my bait. I set my gear off the beach opposite the Pukehina local pub.